Apple Music and Tidal have been battling over streaming service supremacy ever since both platforms debuted earlier this year. Now, the rivalry seems to have turned bitter, as Apple Music reportedly threatened Tidal with a $20 million lawsuit. This disagreement surrounded Drake's appearance at last night's Lil WeezyAna Fest, a New Orleans concert with proceeds going to those affected by 2005's Hurricane Katrina. Because festival namesake Lil Wayne is a co-owner of Tidal, the event was being streamed through the Jay Z-owned service. The New York Post reports that, due to Apple Music's exclusive deal with Drake, the company threatened to sue Tidal if it aired Drake's guest appearance. According the Post's unnamed source, "Legal letters have been sent to Tidal warning that Drake cannot appear on the Tidal stream of the festival, either solo or part of a group, and if the warning was ignored, the liabilities could be up to $20 million." 1/2 Apple is interfering with artistry and will not allow this artist to stream. 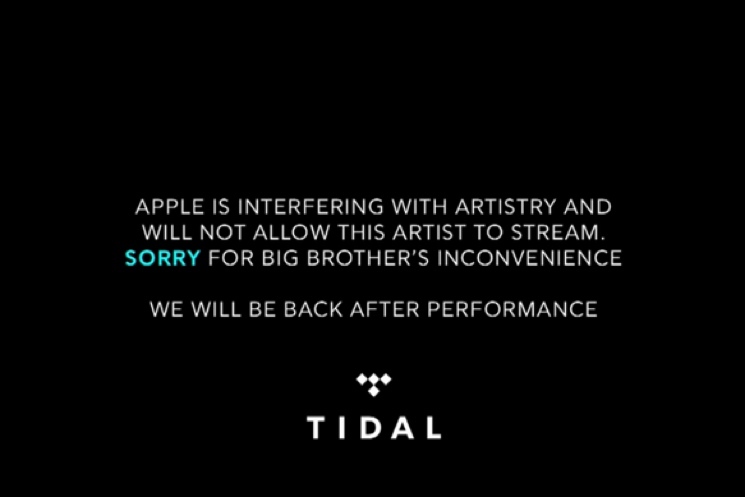 Sorry for Big Brother's inconvenience. According to reports, Drake was initially lined up to be one of Tidal's co-owners, but he dropped out at the eleventh hour and aligned himself with Apple Music.